Are you ready to make a deeper connection with your true self? Journaling can be an amazing tool for self discovery; but when you're not inspired to dig deep, you may end up with endless pages of fleeting emotions, or trivial events. Bringing your true being to light, and recording your rooted emotions, treasured memories, beliefs and values, requires intentional excavating. 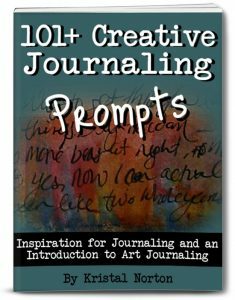 "101+ Creative Journaling Prompts" will guide you to do just that. Within the book, I've compiled 101 of my most inspiring, thought provoking writing prompts designed to help you dig deeper to discover more of your true self and to inspire you on those days where you aren't quite sure what to write about. These prompts will help you to get your imagination flowing, unearth forgotten memories, get you thinking about who you really are, and perhaps bring you clarity or a new angle on how you view yourself. And while you can take the self discovery journey with written journaling alone, when paired with creativity... it creates even more magic. Which is why this prompt book has an added art journaling twist. Within the book I share with you pages of my personal creative journal that were inspired by the prompts in the book, to give you an idea of how each prompt can be used and interpreted in many ways. Also included are 20 of my favorite art prompts to inspire you when you get stuck looking at a blank art journal page. They are so quick and easy that even a beginner would enjoy! Don't have a kindle? Don't worry, there's an APP for that!